Background: Microscale in vitro assays are fast, simple, and inexpensive, with reduced reagent quantities, waste, and experimental animal use. However, they have low reproducibility and low correlation with the results of in vivo models, possibly due to differences in precision and accuracy in methodologies between laboratories. 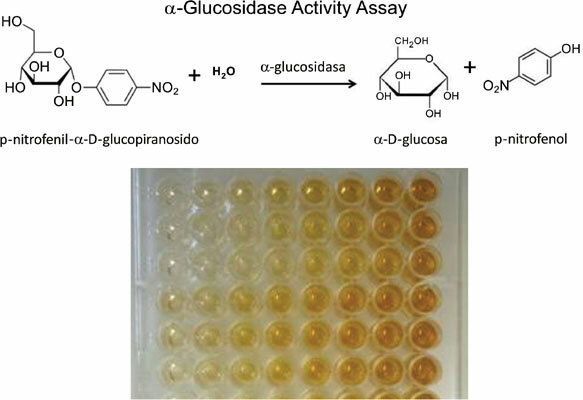 Objective: The objective was the optimization and validation of an in vitro assay, carried out on microscale, to assess the inhibition of α-glucosidase activity, which is indicative of antihyperglycemic activity. Methods: The optimization was carried out using a fractional factorial design taking into account the best inhibition percentage and the absorbance of the controls. With the optimized experimental conditions in hand, we carried out method validation. Results: The optimized conditions were as follows: enzyme concentration, 0.55 U/mL; substrate concentration, 111.5 µM; and 17.5 min incubation at 37°C. A linear range between 100 and 310.2 µg/mL of acarbose (r2 0.994) was established. The RSD was <2% and the % error was <3%. The Z factor was >0.96. This method was applied to four plant extracts, one of which was found to be very active. Conclusion: The method was found to be accurate, precise, selective, linear, and reliable in evaluating the antihyperglycemic activity of natural extracts in vitro. Antihyperglycemic activity, method optimization and validation, α-glucosidase activity, fractional factorial design, acarbose, Z factor. Universidad Autonoma de Nuevo Leon, Facultad de Medicina, Departamento de Quimica Analitica, Monterrey, N. L., Universidad Autonoma de Nuevo Leon, Facultad de Medicina, Departamento de Quimica Analitica, Monterrey, N. L., Universidad Autonoma de Nuevo Leon, Facultad de Medicina, Departamento de Quimica Analitica, Monterrey, N. L., Universidad Autonoma de Nuevo Leon, Facultad de Medicina, Departamento de Quimica Analitica, Monterrey, N. L.